CLOGGED COMBINATION KIT. 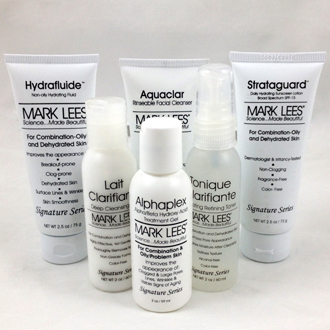 Our six most popular products in the kit that launched MARK LEES to the skin care industry! Perfect for skin that is clogged and constantly fighting pimples. A combination of products that loosen and flush clogged pores, reduce oiliness and hydrate without clogging pores! Includes Aquaclar Rinseable Cleanser 2.5 oz, Lait Clarifiante Milk Cleanser 2 oz., Tonique Clarifiante 2 oz., Alphaplex AHA/BHA Serum, Essential Daily Protection SPF-30 Matte Sunscreen 2.5 oz, Hydrafluide Non-oily Hydrator 2.5 oz. (a favorite of everyone with combination-oily skin!) 6 products.